Community Corner - Daffodil Day, Friday 24th August. 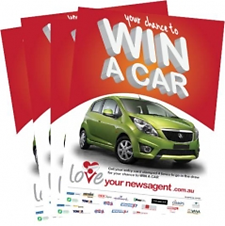 Be sure to pick up your LoveYourNewsagent entry card, in-store this month, for your chance to WIN A CAR! To be in the draw for this fantastic prize simply pick up your entry card in-store and have it stamped on your next three purchases. When you have completed your card place it in the entry box in-store or register online at www.loveyournewsagent.com.au using your card's unique serial number. 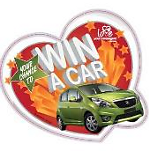 Be sure to enter for your chance to WIN A CAR! The 2013 VTAC Guide is now available in-store for just $12 a copy. The VTAC Guide is published annually by the Victorian Tertiary Admissions Centre contains courses offered by institutions that participate in the VTAC system, information about the institutions, and general information about application procedures. As a gift for Father's Day or simply to update to the latest edition Melway, the 2013 Melway Street Directory is out now and is on special this month for just $44.95. Only available at Patterson Road Tatts, News & Post is the new Guess the Powerball Competition. Each week you are able to enter the competition to pick the Powerball number to be drawn on Thursday night. There is a $2 and a $5 competition available to enter, see the rules below or ask us in-store for further information. $2 or $5 per number. The person who picked the Powerball number wins the total prize money of the game you played. If no-one picked the Powerball number, it ‘Jackpots’ and the prize money is carried onto the next week’s total. If you win the Powerball, you must come in to check, as you will not be contacted. If the prize is not claimed within 7days, then it will be added to the following week’s Jackpot. 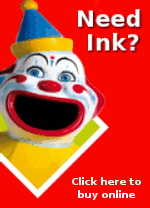 CONDITION OF ENTRY: To be eligible to play, you must purchase at least one Tatts product. With our great range of Hallmark Father’s Day cards you are sure to find the perfect card for Dad on Father’s Day. 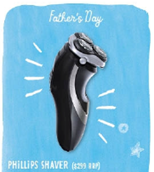 Enter our Father’s Day Competition when you buy your Father’s Day card and you will go in to the draw to win a Phillips Shaver valued at $299. Come in and experience the HALLMARK difference. 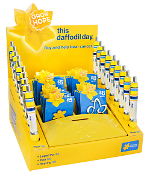 Support The Cancer Council’s Daffodil Day, Friday 24th August, by making a purchase from the selection of lapel pins, pens and key rings.